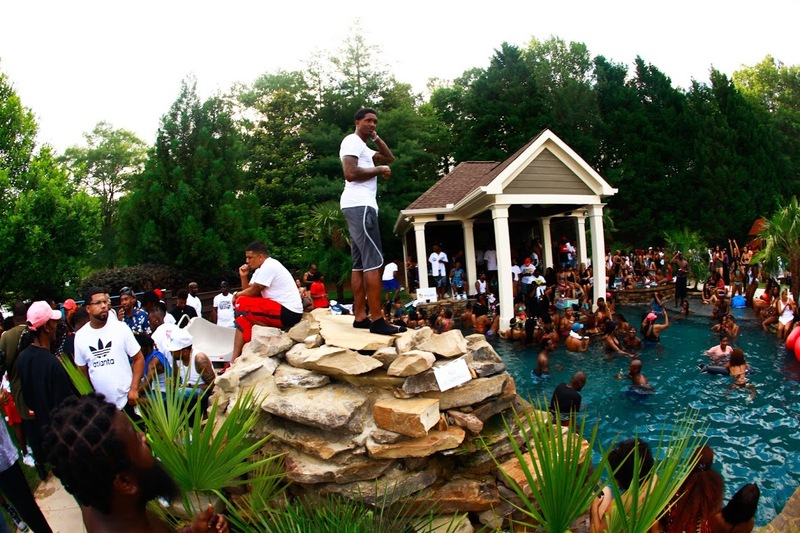 Atlanta, GA. 30 May 2017 – This past weekend, Houston Rockets Forward, Lou Williams, hosted his 2nd annual LouwillVille Memorial Day Pool Party, in Atlanta. Powered by Seagrams Gin and Malibu Black, Lou invited hundreds of Atlanta’s “who’s who” to his mansion to kick-off the holiday festivities. As guests approached the entrance, they were greeted with complimentary ice cream treats from Atlanta Ice Cream Truck and music by DJ Reese & DJ Penny Lane. Lou made sure to bring out all the stops, with an inflatable photo booth provided by Lumee Booth, an inflatable life size twister game and a 22-foot high inflatable water slide for the more adventurous party goer. Seagrams Gin and Malibu Black provided three full bars with delicious summer cocktails, while Keep It Chef created a full taco bar, decked out with all your favorite toppings, alongside of passed hors d’oeuvres including pulled bbq chicken sliders, macaroni and more. As the night went on, everyone made their way into the pool for some summer time fun. “Each year we want to elevate the annual pool party and I think we did just that. Good food, good music, safe environment and great vibes! Thanks to all the sponsors and we’re looking forward to next years edition,” Lou Will states. Notable people in attendance: Josh Smith (NBA) Cameron Payne (NBA), K Camp (Rap Artist), Adreian Payne (NBA), Lira Galore (model), Aleeyah Petty (Tastemaker, Model), Ali (of Rap Group Travis Porter).